An airport without barriers. 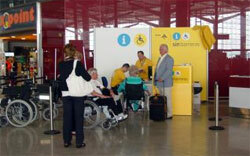 Almost 100,000 passengers with reduced mobility were attended at the terminal in Malaga last year, according to data provided by the airport. For passengers who require this service there are available sixteen meeting points located throughout the airport grounds, both inside and outside the terminals and a number of technical and material resources, among which are 124 wheels chairs, four vehicles fitted with tail lift, five vans and three information desks, among others. Generically, the service provided by the Spanish airports is at departures, the pickup of the person at the meeting point and accompanying to the check-in counter, help in the necessary procedures for billing, accompanying to the boarding area from the customs checkpoints or if necessary, boarding and transport to designated seat on the plane. At arrivals you will be helped with luggage, in moving from the seat to the door of the plane and disembarkation; the exit to the baggage hall, passing the necessary checks, and accompanying to a requested meeting point. In transits / connected flights will be provided the required assistance, including, if appropriate, maneuvering of boarding, landing, transfer through the terminal, and so on.